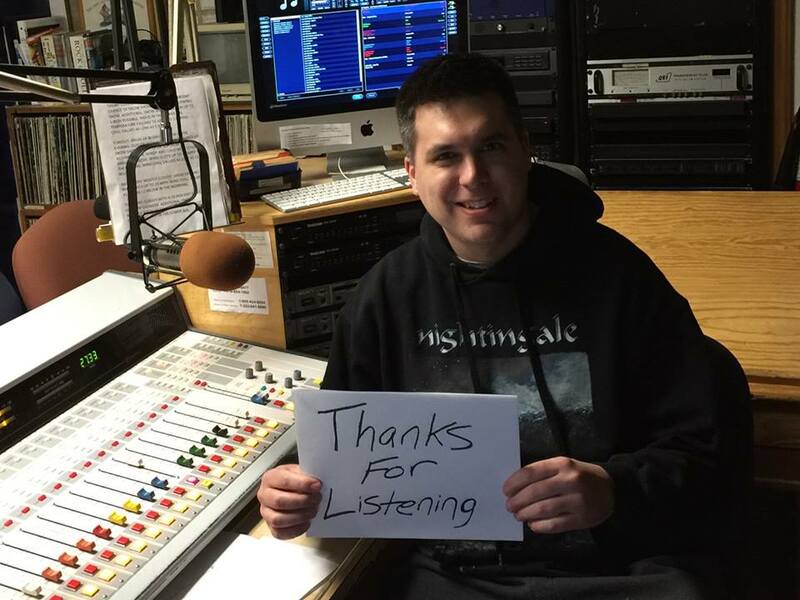 I am saddened to announce that January 12, 2016 will be the last program of Somewhere Between Sunrise & Sunset on 88.3FM. Unfortunately, my personal schedule has not allowed for me to maintain the program to its fullest potential. Therefore Program #631 will be the last. It has been a wonderful 12+ years airing progressive rock old and new for those that have tuned in. Since I was young I always had a passion for playing new music for people so what better outlet than a radio program. I am very happy to have had the opportunity to do that here on 88.3FM, WBWC. I do hope to continue the show as a podcast on the Podomatic network in the near future. Please continue to follow us on Facebook, Twitter and online where I will continue to post progressive rock news and info both locally and worldwide. Many thanks to Ben Toplek, J to tha E, Allen Gunnison (aka Capt Neo), Jason George, Bruce Alger, Michelle Bouffard, Kevin Skalba, Jason Connelly, Dan Swanö, Dag Swanö, FreddeGredde, Professor Prog and everyone at ProgNight, Dave in Bay Village, Riccardo Scivales and Quanah Parker, Magic Pie, Rowen and Persephone's Dream, Gravity, all the bands and labels that sent in music for airplay, everyone who I've worked with at WBWC over the years, and countless others I've unintentionally left out. Thanks for listening and hope you'll tune in again next time! Genesis - "Watcher of the Skies"
Genesis - "In the Cage (Medley - Cinema Show/Slippermen) / Afterglow (Live from Three Sides Live)"
Satellite - "The Evening Wind"
FM - "Phasors on Stun"
FM - "Brave New Worlds"
Nightingale - "On Stolen Wings"
Unicorn - "The Likes of Noone"
Dag Swanö - "En älskad formulering"
Blind Owl - "Digital Animal Suite"
Magic Pie - "Motions of Desire"
Magic Pie - "Trick of the Trade"
FreddeGredde - "Welcome the Bright Skies"
Falling Edge - "Minstrel in the Corner"
Opeth - "To Bid You Farewell"
program notes: Annual four-hour feature program counting down the Top 25 of 2015. Compiled by airplay, listener response and request. Tune in Tonight! 1-5-2016 The annual best of countdown with the TOP 25 of 2015! Genesis - "One for the Vine"
Perfect Beings - "The Love Inside"
Hawkwind - "The Psychedelic Warlords (Disappear in Smoke)"
L'ensemble raye - "A ma taie"
Area - "Arbeit macht frei (Live)"
The Mothers of Invention - "The Little House I Used to Live in (Live)"
Mystery - "The Weeping Willow"
Opus Avantra - "Les plasir sont deux"
program notes: New music by Perfect Beings, Ossicles, Nad Sylvan, Sonar & Mystery. A salute to Lemmy Kilmister with the music of Hawkwind. Tune in Tonight! 12-29-2015 Nad Sylvan, Perfect Beings, The Mothers of Invention, Area, Hawkwind, Mystery & more! Tune in tonight on Somewhere Between Sunrise & Sunset "your program of progressive rock" program #629. New music by Mystery, Nad Sylvan, Sonar, Perfect Beings & Ossicles. Plus The Mothers of Invention, Farpoint, Area and a salute to Lemmy with music from where he got his start in Hawkwind. Hope you'll join the prog-party and tune in starting at 10PM (EST) after the AP Radio News on the dial at 88.3FM locally, online live from anywhere in the world at wbwc.com or via the TuneIn Radio app from your favorite device. Genesis - "All in a Mouse’s Night"
California Guitar Trio - "Happy Xmas (War is Over)" Jethro Tull - "First Snow on Brooklyn"
Magnum - "On Christmas Day"
Sufjan Stevens - "Get Behind Me, Santa"
Doctor Octoroc - "Super Jingle Bros"
Doctor Octoroc - "Kraid, Rest Ye Merry Mother Brain"
Trans-Siberian Orchestra - "Good King Joy"
The Flaming Lips - "Have Yourself a Merry Little Christmas"
Marillion - "Carol of the Bells"
The December People - "Little Drummer Boy"
Mark Kozelek - "Christmas Time is Here"
Mark Kozelek - "I Believe in Father Christmas"
Greg Lake - "I Believe in Father Christmas"
The Moody Blues - "The Spirit of Christmas"
Pellek - "Twelve Days of Christmas"
Dweezil Zappa - "You’re a Mean One, Mr Grinch"
Robbie Robertson - "Christmas Must Be Tonight"
Vince Guaraldi Trio - "Linus and Lucy"
Falling Up - "Song in the Air"
Al di Meola - "Midwinter Nights"
Jordan Rudess - "White Christmas"
I Like Trains - "The Christmas Tree Ship"
Chris Squire’s Swiss Choir - "Sussex Carol"
Aqua Teen Hunger Force - "Feliz Navidad"
Aqua Teen Hunger Force - "Santa Left a Booger in My Stocking"
Aqua Teen Hunger Force - "The Little Drum Machine Boy"
Bob Rivers - "The Twelve Pains of Christmas"
Trans-Siberian Orchestra - "Wizards in Winter"
Sufjan Stevens - "Put the Lights on the Tree"
Sufjan Stevens - "Come on! Let’s Boogey to the Elf Dance"
Tune in Tonight! 12-22-2015 "Christmas-Prog" by Jethro Tull, Marillion, California Guitar Trio, The Flaming Lips, Chris Squire & more!!! Tune in tonight on Somewhere Between Sunrise & Sunset "your program of progressive rock" program #628. Music for the season with three hours of Christmas-prog by Jethro Tull, the Flaming Lips, Chris Squire, The December People, California Guitar Trio, Marillion, Jordan Rudess, Sufjan Stevens & more!! Hope you'll join the prog-party and tune in starting at 10PM (EST) after the AP Radio News on the dial at 88.3FM locally, online live from anywhere in the world at wbwc.com or via the TuneIn Radio app from your favorite device. Genesis - "Unquiet Slumber for the Sleepers...In That Quiet Eath"
Mystery - "The Willow Tree"
Simon Steensland - "The Idiot"
Roz Vitalis - "Invisible Animals"
Unreal City - "Ex Tenebrae Lux"
Guapo - "Obscure Knowledge Part III"
Il Rovescio della Medaglia - "Live in Tokyo"
program notes: New music by Mystery, Roz Vitalis, Simon Steensland, Unreal City, Guapo & Sylvan. Tune in Tonight! 12-15-2015 Mystery, Simon Steensland, Roz Vitalis, Genesis, Rush, IQ & more! Tune in tonight on Somewhere Between Sunrise & Sunset "your program of progressive rock" program #627. New music by mystery, Roz Vitalis, Simon Steensland, Sylvan, & Unreal City. Plus... Genesis, Guapo, RUSH, IQ & live rock progressivo Italiano by Il Rovescio della Medaglia. Hope you'll join the prog-party and tune in starting at 10PM (EST) after the AP Radio News on the dial at 88.3FM locally, online live from anywhere in the world at wbwc.com or via the TuneIn Radio app from your favorite device. Genesis - "Harold the Barrel"
Genesis - "The Cinema Show"
Steve Hackett - "Love Song to a Vampire"
Steve Hackett - "Every Day (Live at Nottingham Central TV Station, October 1990)"
For Absent Friends - "Both Worlds"
Ossicles - "Girl With the Glass Eye"
Museo Rosenbach - "Zarathustra (Live in Tokyo)"
The Tea Club - "The White Book"
Eziak - "The War is Over!" Thinking Plague - "Organism (Version II)"
Kayo Dot - "Offramp Cycle, Pattern 22"
program notes: New music by Ossicles, Eziak & M-Opus. Marillion announce 2016 North American Tour with a stop at the Hard Rock Rocksino on October 29, 2016. Recap of Steve Hackett's "Acolyte to Wolflight with Genesis Revisited" Tour at the Hard Rock Rocksino on December 4th. Tune in Tonight! 12-8-2015 Ossicles, The Tea Club, Thinking Plague, Museo Rosenbach, Steve Hackett & more!! Tune in tonight on Somewhere Between Sunrise & Sunset "your program of progressive rock" program #626. New music by Ossicles, The Tea Club, Eziak & M-opus. Plus... Thinking Plague, Museo Rosenbach & Genesis. We'll also recap the Steve Hackett performance last week at the Hard Rock Rocksino Northfield Park. Hope you'll join the prog-party and tune in starting at 10PM (EST) after the AP Radio News on the dial at 88.3FM locally, online live from anywhere in the world at wbwc.com or via the TuneIn Radio app from your favorite device. Tune in Tonight! 12-1-2015 Archive Broadcast of Program #618 Roger Waters, IQ, echolyn, Kinetic Element & more! Tune in tonight on Somewhere Between Sunrise & Sunset "your program of progressive rock" for an archive broadcast of program #618 which originally aired on September 29, 2015. New music by The Aaron Clift Experiment, Cloud Over Jupiter, FM, Telergy, Kinetic Element & Echolyn. Plus Frank Zappa, Buckethead, IQ, Roger Waters, Genesis & more!!! Hope you'll join the prog-party and tune in starting at 10PM (EST) after the AP Radio News on the dial at 88.3FM locally, online live from anywhere in the world at wbwc.com or via the TuneIn Radio app from your favorite device. Genesis - "In the Cage"
Nik Turner - "Adjust the Future"
Van der graaf Generator - "A Place to Survive"
Vy - "Asleep or Dead"
Billy Sherwood - "Divided By One"
Cloud Over Jupiter - "Love Still Remains"
Magic Pie - "According to Plan"
Magic Pie - "Tears Gone Dry"
Magic Pie - "The Silent Giant"
Psicomagia - "El Congreso Pt. 1"
Richard Pinhas - "Paul Atreides"
program notes: New music by Nik Turner, Vy, & Billy Sherwood. Magic Pie's 4th album KING FOR A DAY featured in the "Vinyl Confessions" segement. Cuneiform Records release first-ever vinyl reissue of Richard Pinhas' 1978 album Chronolyse. Steve Hackett brings his from Acolyte to Wolflight with Genesis Revisited tour to the Hard Rock Rocksino on December 4th.